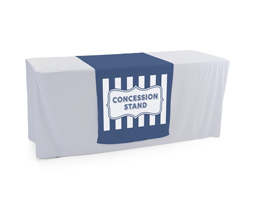 Create an attractive and professional display with trade show table covers. From inexperienced exhibitors to the more seasoned veterans, successful trade event planners know the importance of a well-designed exhibit booth. One of the most important pieces of a perfect trade show booth is its table treatments, including table runners, tablecloths, and other coverings. 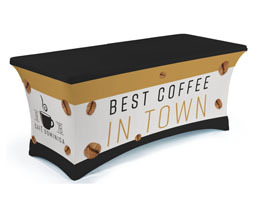 A great table cover can help improve a company’s presentation at not only trade shows, but business conventions, hotel events, job fairs, storefronts, farmers’ markets and much more. 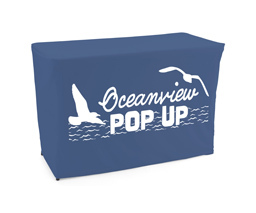 For businesses looking to promote brand awareness, custom tablecloths are a must. Table space is prime real estate in any trade show or event. It’s where vendors and exhibitors connect with potential customers the most. A well-dressed table is the perfect place to display giveaway merchandise, printed materials, samples, handouts, business cards, and other promotional items. Don’t waste that premium quality advertising space with a boring table or a lackluster tablecloth. 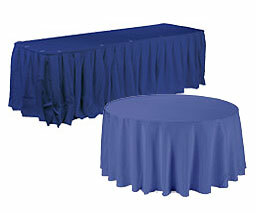 From trade show exhibits to other events, Displays2go carries a huge selection of table covers for any setting. With hundreds of styles, colors, and sizes, there’s a tablecloth for every unique need and use. Unprinted - Plain table throws are a solid economic choice for those looking throw together an easy table presentation on the cheap. They cover unsightly tables and can help create a cohesive look to your overall display. Custom Printed - Custom and imprinted table covers are one of the most effective and powerful ways to promote your business at any event. Available in single, multi, and full color options. Print graphics or your company’s logo to advertise your brand. 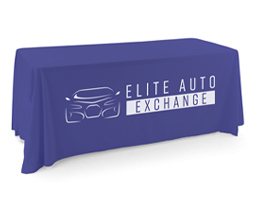 Branded tablecloths can even make exhibit booths more inviting and attract customers. 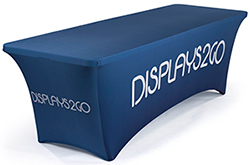 Convertible - Adjustable length table throws are great for vendors who need flexibility in their displays. Stretch Fabric - Stretch fabric tablecloths are fitted, eliminating wrinkles and resulting in a polished, modern look that screams professionalism. 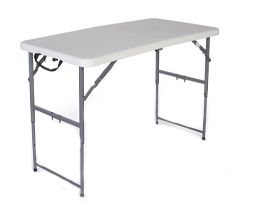 3-Sided and 4-Sided - Opt for a full coverage tablecloth to easily hide equipment stored underneath your table. Three-sided covers, however, offer easy access to supplies for vendors that need to move at a faster pace. No matter what your business is or how big of a budget you have, Displays2go offers a greater choice of options for your trade show table cover needs. From custom printed tablecloths to eye-catching table runners, we carry a large inventory of coverings to help businesses express themselves professionally.